2014.08.03 What Is A "First?" I was the first child my parents ever had. Actually that’s not quite true. There were three before me who never made it. I set no precedents, yet I felt first-ish, and so, I'm sure, did my parents. As a "first" I was a cause célèbre and a bête noir. “There is nothing new under the sun.” So says Qoheleth (Ecclesiastes). So how can there by any true firsts under the sun—or the moon? There can't of course, yet we earthlings need to categorize, rank, and order things, and whoever says we don’t do that is probably a liar, because we all do it. Even so, it is good to remember that, spiritually, you are never first or last or new. You are only precious. The first group of women, in collaboration with a few good men, to defy Episcopal church canon law in 1974 and be ordained priests, were historic "firsts." They were icons to some and iconoclasts to others. To honor these women, I offer this “first”: the Rev. Elizabeth Alfred, the first woman priest to celebrate Holy Communion on her 100th birthday, January, 10, 2014, in Melbourne, Australia. 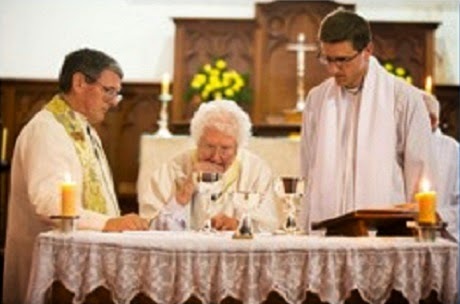 According to Muriel Porter, reporting for the diocese of Melbourne, Alfred was the first woman ordained priest in Melbourne December 13, 1992, when Archbishop Keith Rayner ordained 12 women in a long-awaited historic ceremony. She was 78, well beyond retirement age, but Archbishop Rayner had promised this significant pioneer that age would not prevent her ordination—when it finally became possible. She waited in the wings for some time. Alfred's centenary birthday Eucharist was, most appropriately, back at St James’, Dandenong, where she had ministered as a deaconess, and where she did much of her waiting and dreaming of presiding on her 100th birthday. The church was packed. The preacher, former St James’ vicar the Rev'd Alan Baker, pondered whether this was another "first": has any other woman ministered in the same place as deaconess, deacon, and priest? Family members, friends, parishioners and clergy colleagues, some of whom had traveled considerable distances, burst into sustained spontaneous applause as Alfred entered the church, vested in a chasuble. Frail after some weeks of illness that she had feared might abort her long-held dream of presiding on her 100th birthday, she needed the assistance of a wheeled walker to get to the altar. Parish clergy helped and stood by. But when this centenarian "first" spoke – to absolve, consecrate and bless – her voice was clear and strong. There was no doubt who was presiding at this special Eucharist. There are no firsts in God's eyes; all souls are equal. But I bet if there are angels, they applauded and trumpeted alleluias anyway. They know we earthlings need to remember "firsts" so we can keep going—on earth as it is in heaven.